200g mix of mozzarella, ham chopped together. Cook the rice for 15 minutes with the saffron in salted water until soft and yellow. Drain well and add the butter. Then add the grated cheese, some freshly ground black pepper and mix well. In the meantime, beat and season the eggs. When the rice is cool, wet one hand and spread some rice (about 2cm thick) on it. Add mozzarella, ham and a spoon of bèchamel sauce in the middle and close the rice into a little ball about the size of a small orange, making sure the contents stay inside. 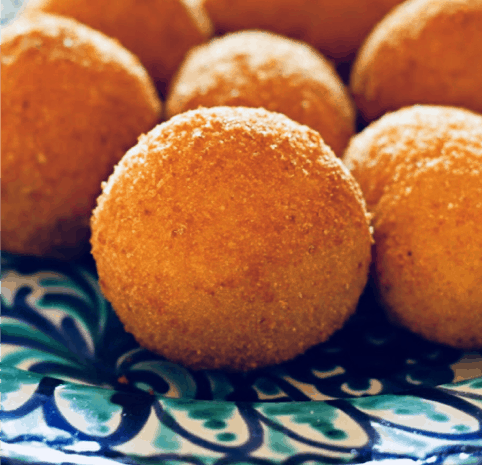 When all 10 rice balls are ready, roll them one by one in the egg and then in the breadcrumbs. Deep Fry in hot oil until golden brown and place on kitchen roll to remove any excess oil. Serve while hot and crunchy.